For the first time, on the eve of The Ghosts of Bronxville event for young children, Bronxville Historical Conservancy adult members were invited to a preview party at the 1891 historic home and studio of artist Mary Fairchild MacMonnies Low. Shadowy sets, exhibiting intricately displayed historic artifacts and ephemera related to Mary and her artist husband, Will Hicok Low were the backdrop to several historic ghosts who shared their life stories and connection to the village of the 1890’s. 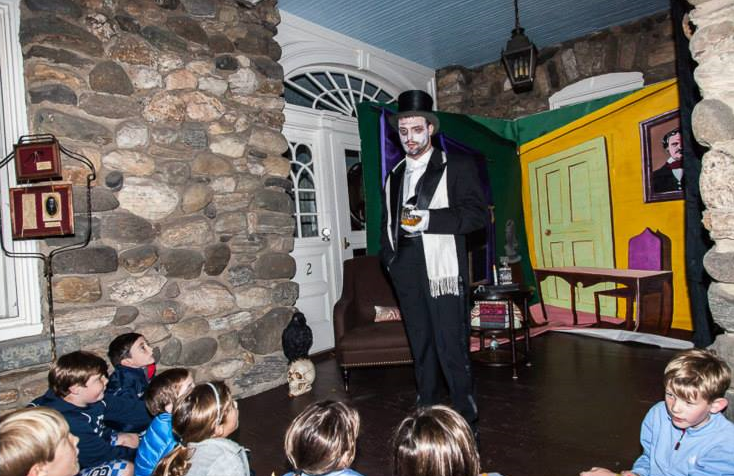 The following night, more than a dozen eerie apparitions visited the village for the spooky spectacular that introduced 225 kids and their chaperones to the town’s rich history. The thrill-seekers navigated moonlit Hilltop roads to homes where they met five of Bronxville’s famous 19th century residents played by Sarah Lawrence College students sharing their ghostly tales on historically-detailed sets. Along the route, children played old-fashioned Halloween games and encountered several silent, scary spirits portrayed by local high school students.